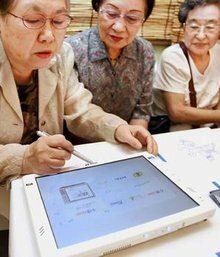 In Japan, with its love of technology and a declining birth rate, a growing number of elderly are learning to surf the Internet, finding it to be a crucial lifeline. The Computer Grannies Society, is launched in 1997 to nurture a new group of net-surfing elderly. The above two women are members of this society. The group, which accepts men as well, now has 200 members, mostly in their 70s.The oldest member is a 97-year-old woman who lives alone in the western city of Kyoto. The members exchange messages and photos, and show each other their creative work – paintings, novels, poems and music. They organise off-line gatherings such as tours of big electronics stores. They also shop online. “Bookstores are becoming bigger these days and it’s hard to find a book I want. It’s quite easy online,” Kamata says. They have also started a internet cafe to give computer lessons to senior citizens.